Aaron’s been hinting that he’d like me to make a quiche for weeks, and finally finding a Sunday morning when I wasn’t rushing out to do yard work, I was able to make one this weekend. And it turned out SUPER DELISH. So I thought I’d share the recipe! Preheat oven to 400 degrees. Line pie plate with crust. This is a good recipe for pie crust or you can be like me and use a refrigerated crust because, c’mon, it’s 10:00 a.m. on a Sunday morning. Bake for 5-7 minutes until light golden brown. If you pull out the crust and it’s ballooned on the bottom, just poke it with a fork. Reduce heat to 325 degrees. In a large skillet, cook the bacon, then transfer to a plate with paper towels to drain. While the bacon is cooking, chop your onion, zucchini and asparagus. For the zucchini, I sliced it very thin then halved the pieces. When you’ve removed the bacon from the skillet, add the vegetables to the grease and cook until tender, about 5 minutes. If you keep a jar of bacon grease in your refrigerator (ahem) and would like to add a bit more, feel free. 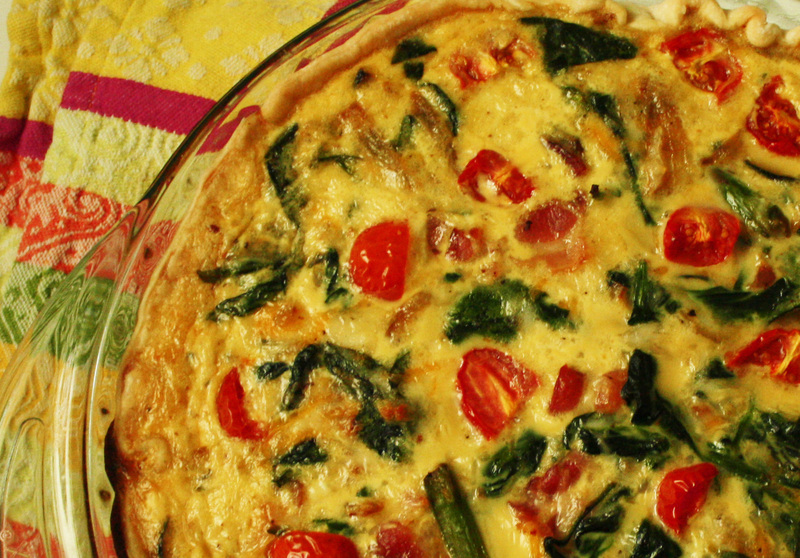 When the vegetables are tender, add the spinach and toss until it’s wilted. The spinach should soak up any extra moisture in the skillet. If not, drain the liquid. In a large bowl, beat the eggs, add the milk, crumble the bacon and add it, stir in the vegetables and season with salt and pepper (and Cavender’s if you’re like me and add it to everything). Stir in cheeses until just combined then pour into the prepared pie crust. 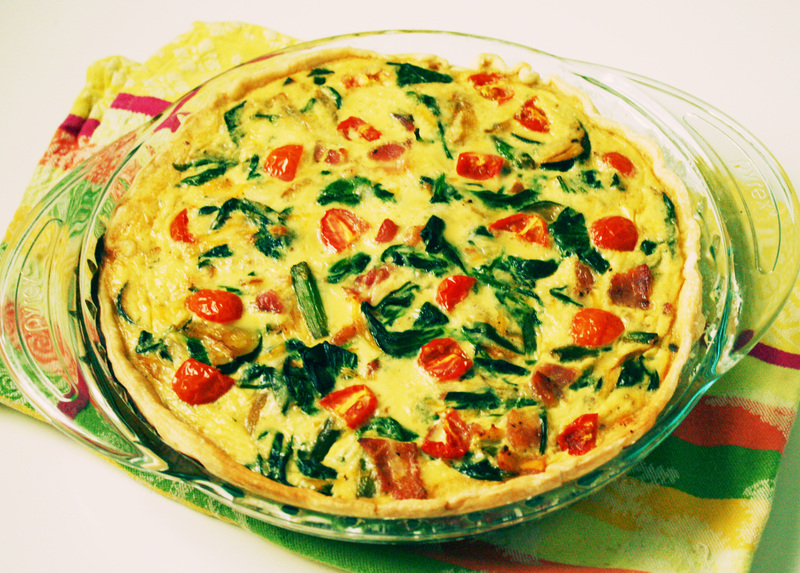 I topped the quiche with the halved tomatoes and even though we aren’t big tomato people, it turned out really well. Bake at 325 degrees for 1 hour or until set. Remove from oven and let cool for at least 20 minutes before cutting. Thank me later.